These Monroe Township homeowner increased their home security, outdoor safety and property value by having LED lighting installed. The professional outdoor lighting team at Outdoor Living Landscape provided the high quality solid brass fixtures along with professional wiring, lighting placement and direction, for a quality installation. The wiring was strategically run and hidden under the walkway and inside of electrical conduit. ODL uses a hub wiring system that ensures adequate voltage and no drop off. Outdoor Living Landscapes uses on solid brass LED outdoor fixtures that have a lifetime warranty. The high quality LED bulbs included with each fixture have a 2 year warranty. Brass outdoor lighting fixtures used by Ron and his team are manufactured with solid brass with one of the most durable materials you can use outside. Solid brass fixtures make for a highly appealing bullet light, pathway or well light. 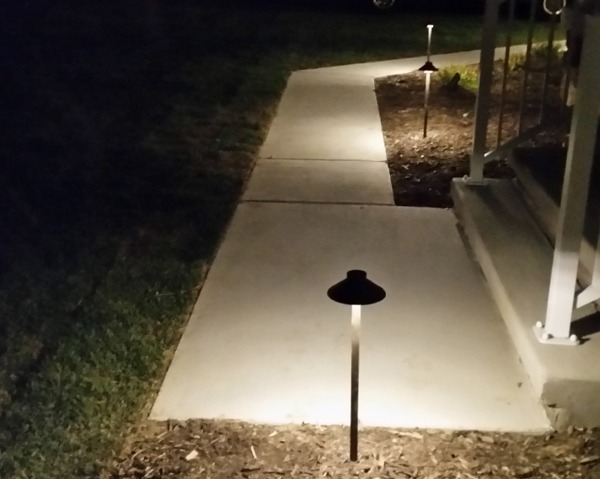 Long-lasting brass outdoor lighting will keep your driveway, walkway, landscaping or home illuminated for a lifetime, even through harsh New Jersey weather. 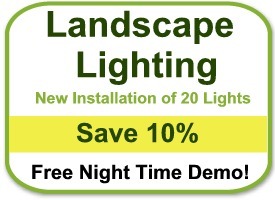 Well lights are used by landscape lighting professionals for in-ground lawn applications and for up-lighting trees, columns, and architectural features when an above-ground fixture is not desired. Bullet lights derive their name from the shape of the fixtures. They give the installer great flexibility with their ability to be easily directed at virtually any angle. Bullet lights commonly feature a 6 Watt MR16 LED bulb.